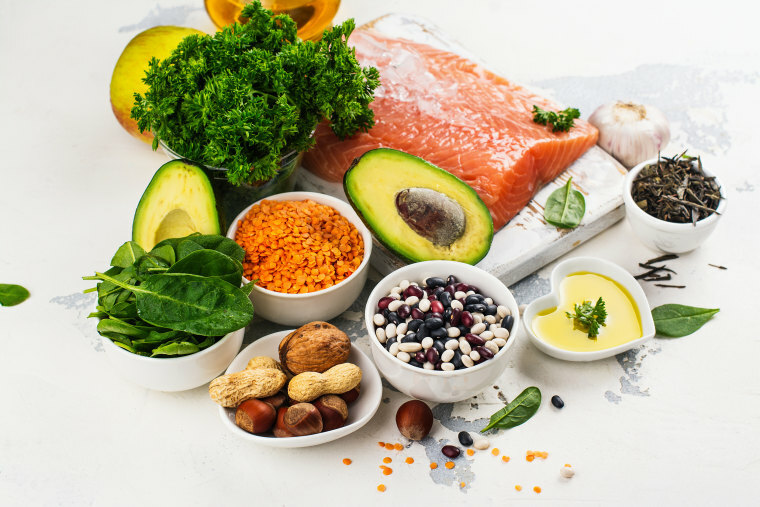 Protein has a starring role in many popular diets like Keto, Paleo and Whole 30, but how much do you really need for optimal health and weight loss? There are three macronutrients — protein, fat, and carbohydrates — but these days, it seems like all anyone wants to talk about is protein. Read about a popular diet —from Whole 30 to Keto to Paleo — and protein has a starring role. Walk through the grocery store and you’ll be bombarded with protein callouts on everything from pasta (made from plant protein, of course!) to bars to cereal to yogurt, and more. According to one survey, 60% of consumers are looking to get more protein in their diet. Given its star status, it’s a good idea to get clear on what protein can (and can’t) do. Protein provides the structural support for every cell in your body, and it’s a component of skin, joints, bones, nails, muscles and more. Without getting overly complicated, proteins are involved in how your immune system functions, hormone regulation, and the transmission of signals from one organ to another. The protein we eat from sources like chicken, beef, seafood and beans is made up of smaller compounds called amino acids. There are 20 amino acids, nine of which are considered essential because your body needs them and they must be obtained from food. The remaining amino acids can be obtained from food sources, but even if you don’t eat them, your body will get them by breaking down other proteins so they aren’t “required,” so to speak. The truth is, you don’t need that much protein for your body to function properly. In order for your body to support its basic needs, you need 0.8 g of protein per kilogram of body weight. Hang on to your calculator! Stats suggest that most people easily achieve this target, and in fact, the average adult consumes about 90 grams of protein per day. The recommended dietary allowance, or RDA, of 0.8 g per kilogram may be a low bar, says Douglas Paddon-Jones, PhD, FACSM, Sheridan Lorenz Distinguished Professor in Aging and Health, Department of Nutrition and Metabolism, The University of Texas Medical Branch. To offset some of the muscle decline that occurs as we age and to get the feel-full benefits, he recommends more. However, what’s just as important is how you’re spreading out your protein throughout the day and ensuring you’re making smart protein picks. Specifically, experts stress the benefits of eating a protein-packed breakfast. So if you’re used to cereal when you wake up and chicken for dinner, you need to make sure you’re boosting your AM meal with more protein. Here’s why: When you sleep, your body begins to break down protein, which is thought to play a role in why we slowly lose muscle as we age, explains Donald K. Layman, PhD, Professor Emeritus of the Department of Food Science & Human Nutrition at University of Illinois. Until you begin stoking the repair and replace phase by eating a protein-rich meal, your body will continue to stay in break down mode. The right range seems to be from 20 to 35 g at breakfast, according to the experts I spoke with. From there, you want to continue to aim for similar amounts at each meal. Mathematically speaking, if you’re looking to slim down, when you add something to your diet — in this case, more protein — you have to take something out. But assuming you’ve adjusted for your calorie needs (say, by sizing down your carb portions), a protein-rich menu will give you an edge. “Protein burns about 10 to 20 extra calories a day, which might not seem like a lot, but it’s enough to counteract the one to two pounds that Americans gain every year,” she explains. It also helps you feel fuller longer, which helps prevent overeating. As anyone who has lost weight (or tried to) knows, hunger is enemy number one. Beyond weight loss and hunger management, packing your meals with protein helps you hold on to precious muscle as you age. Though skimping on protein at a single meal won’t do any damage, each time you fall short, you’ve missed an opportunity to activate protein synthesis in your muscles. If this happens often and you’re over 35 years old, your muscle mass may start to decline, explains Paddon-Jones. And of course, for those looking to transform their physique with diet and exercise, protein is your friend. “Adequate protein is needed for muscle maintenance, as well as for healing from the wear and tear exercise puts on the body. Athletes have greater protein needs for two reasons: they generally have more muscle mass, and they require this key building block for exercise recovery,” says Cynthia Sass MPH, RD, a New York and Los Angeles-based performance nutritionist. However, to gain muscle mass and strength, you need to be exercising adequately as well. Simply eating protein won’t produce Michelle Obama biceps. Assuming you are, timing your protein intake is also key. “Athletes should include protein in every meal, spread fairly evenly throughout the day, although protein should be minimized 60-90 minutes pre-exercise in favor of easy to digest, nutrient rich carbs for fuel. Post-exercise meals should always include lean protein, combined with lots of veggies, anti-inflammatory fat, whole food sources of carbohydrates, and plenty of antioxidant-rich herbs and spices. This combination maximizes the ability to use protein for muscle repair and building,” says Sass. Certainly, there seems to be benefit to consuming more than the actual RDA for protein. However, at a certain point, your body may reach a threshold for both hunger management and muscle building, and at that time, additional protein will be stored like anything else you eat in excess: as fat. Also, as Baum repeatedly mentioned, simply adding protein without removing something could put you over your daily calorie needs, which will promote weight gain — not loss. That said, unless you have kidney disease or uncontrolled diabetes, there doesn’t seem to be a risk to consuming a protein-heavy diet, according to Baum. According to registered dietitian Marie Spano, RD, sports nutritionist for the Atlanta Hawks, Braves, and Falcons, though vegans and vegetarians can definitely get what they need with plant-based protein, there’s a difference between plant and animal sources. Protein from animal sources provides all the amino acids and is more available to your body whereas protein from plant compounds isn’t as readily available (and for the most part, they do not provide all 20 amino acids). So while you don’t need to eat meat to get the protein you need, you do have to put a little more thought into your diet to make sure you’re getting a variety sources at each sitting. The main protein sources in a meatless diet are soybeans and pulses (such as chickpeas, lentils, peas and other beans), as well as nuts, seeds and whole grains. “You need to mix plant proteins together (versus eating one alone) to get all essential amino acids during your meal,” says Spano. What about protein powders and collagen? “Protein powders do serve a purpose,” says Renee Korczak PhD, RDN, United Team dietitian and assistant teaching professor at the Department of Food Science and Nutrition, University of Minnesota Twin Cities. Protein isolate as part of a smoothie or shake, for example, can be a convenient way to reach optimal ranges, particularly at breakfast when many Americans are accustomed to reaching for foods like toast, bagels and cereals, which are poor sources of protein. Just be sure you’re using a quality source of protein powder, whether whey-based or a plant-based one, like pea protein. Also inspect the ingredient list for artificial ingredients, like colors or flavors, and for added sweeteners. The benefits of collagen peptides, however, may be limited to its impact on your joints and inflammation. These supplements, which contain a chain of amino acids to form collagen, an abundant protein in skin, hair, nails and joints, are touted for many things, but the experts who weighed in are skeptical about their benefits to ignite strength gains or changes in body composition. That said, the evidence suggests collagen peptides may be beneficial by reducing pain in people with osteoarthritis, and supplementation may offset some of the wear and tear on your joints and ligaments and reduce the risk of injury among active folks. As with other supplements, if you’d like to try collagen peptides, make sure you’re choosing one from a quality manufacturer.